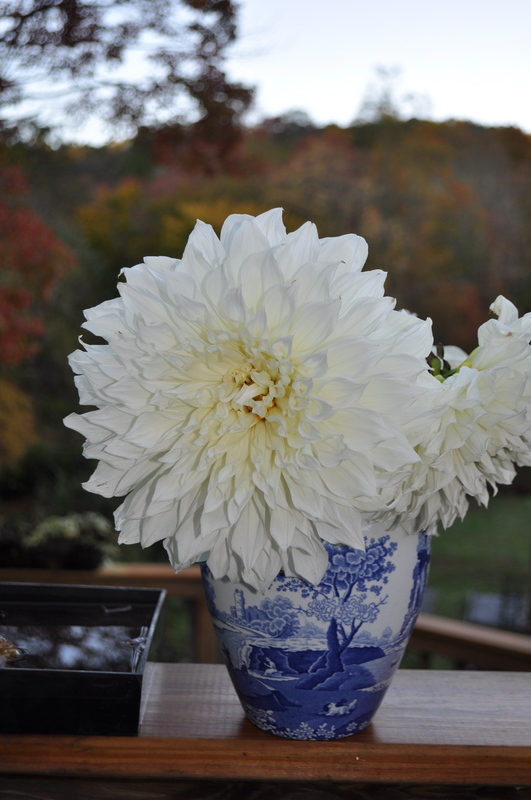 The last dahlias have been cut, and pots moved indoors or tossed in the compost pile. Praise for Dahlia ‘Show n Tell’ was awarded at a flower show in Englewood NJ on Friday, and a frost that same night felled all the others. The week-end was spent digging the tubers and covering their beds with leaves and landscape cloth. 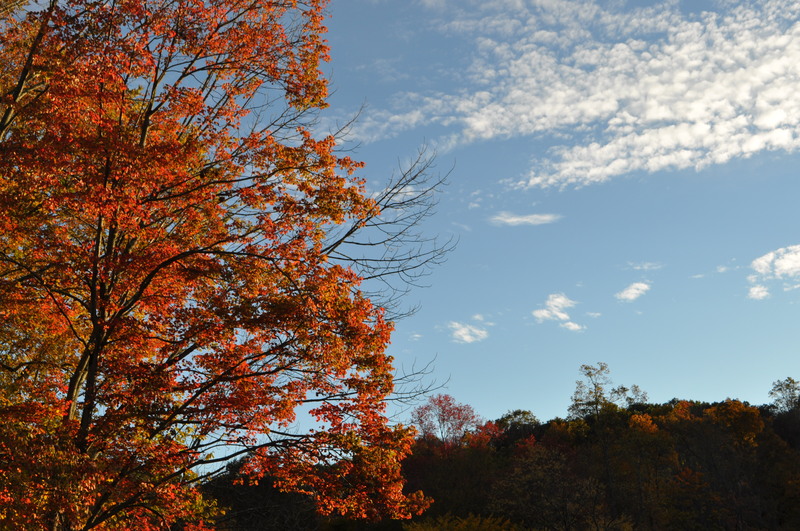 There is a soft aura of Autumn ; before the rich reds and golds set flame to the landscape. A yellow mum tries to bring to mind what we hope is around the bend. 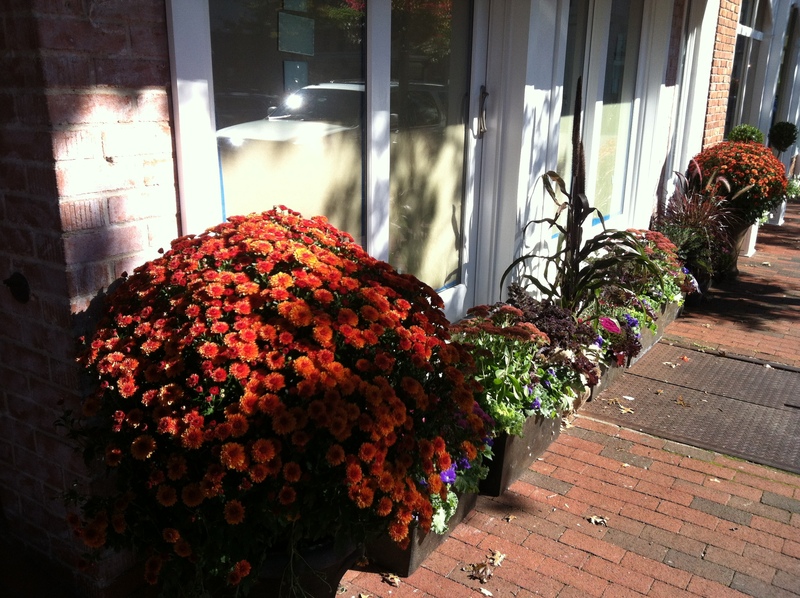 Our downtown pulls the geraniums and impatiens, and brings on the signs of Autumn – a brief commercial period surrounding Halloween and Thanksgiving. Because you know what is coming after that! Carpe Diem’s new tapas bar! So say good-bye to dahlia season, the dahlias have won their prizes and graced the home, even worked their charm as birthday gifts and condolences. The aura of Autumn is all around with the blaze of the best still ahead. 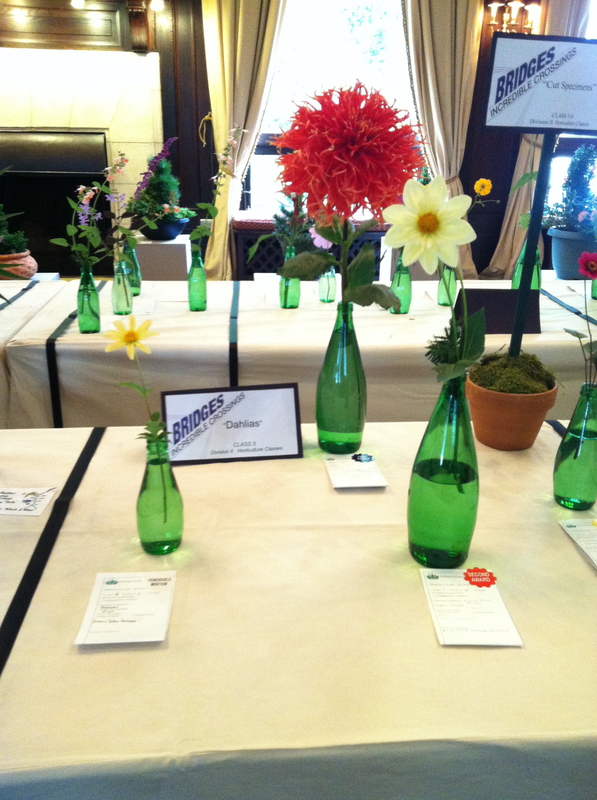 This entry was posted in Dahlias, Uncategorized and tagged Autumn, Dahlia 'Show n Tell', Dahlia Fleural, raised beds. Bookmark the permalink. We haven’t had a frost hard enough to kill off the dahlias yet – one of my plants has a bud just opening but I don’t suppose it will have time to amount to much – it signals the end of another gardening year alas. I enjoy seeing your dahlias, since I don’t grow any here, and the mums are so cheerful, calling out that fall is here! I LOVE your raised beds. I’m with Holley – LOVE your raised beds! The dahlias are beautiful. I didn’t grow any this year, but I especially like to grow the singles – they seem to do best in our part-sun garden and containers. 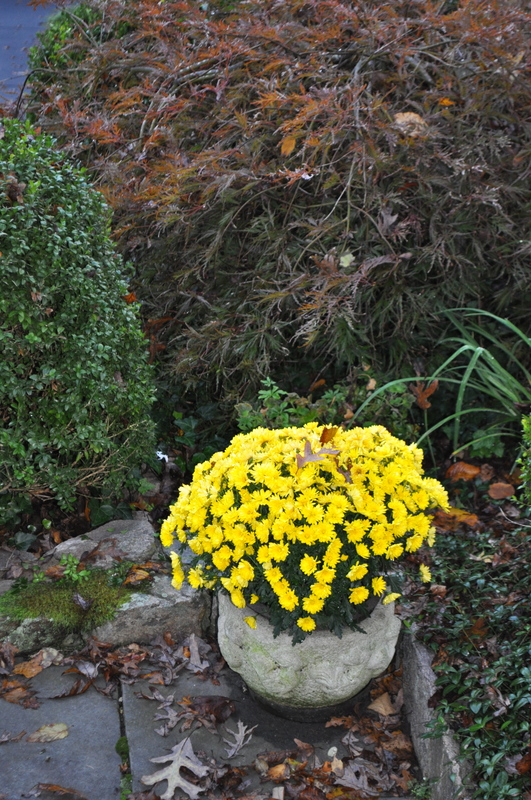 Hi Jayne, I really like the cement pot that holds the yellow mums. That whole vignette is gorgeous. 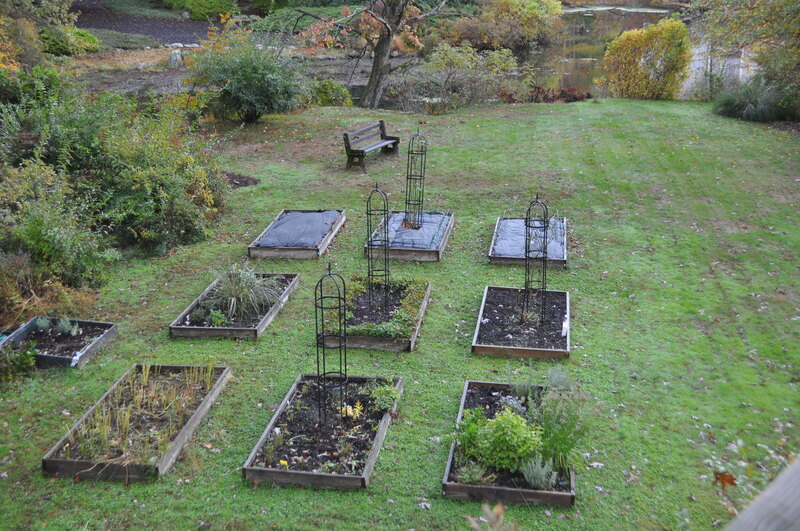 Your raised beds look wonderful even if it is the end of the season. We’re getting sunshine today and the trees are so vibrant. Although I’m not a huge fan of autumn, I love the colors. Thank you for visiting. The pot was a gift and I love it too! But don’t love that the deer came by and ate the mums soon after the photo was taken! Oh well!